RECRUITMENT OF SPORTS PERSONS AGAINST SPORTS QUOTA – OPEN ADVERTISEMENT FOR THE YEAR 2018-19. 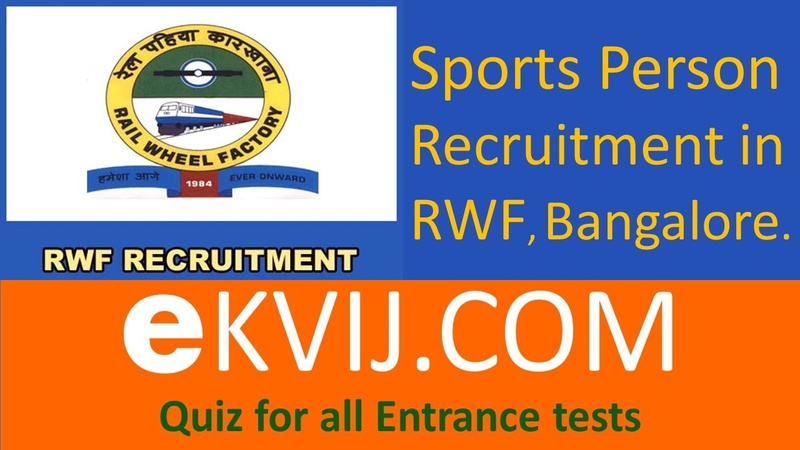 Railway job aspirants has another opportunity, RWF (Rail Wheel Factory), Bangalore has announced recruitment notification for eligible sports persons, for recruitment to posts in Level -1 of RS(RP) Rules, 2016 (erstwhile Pay Band Rs. 5200 – 20200 + Grade Pay Rs. 1800/-). The total vacancies in Sports Quota is 10. RWF has decided that the age limit of the applicants is 18 – to – 25 and no age relaxation is permitted to the candidates. 1 Born Between 02 – JAN – 1994 To 01 – JAN – 2001. 3 The date of reckoning age shall be 1st January 2019. Pay matrix Level – 1 RS(RP) Rules, 2016 (erstwhile Pay Band Rs. 5200 – 20200 + Grade Pay Rs. 1800/- 10th Pass plus National Apprenticeship Certificate (NAC) granted by NCVT. For recruitment in Civil Engineering, Mechanical, Electrical and S&T. 10th Pass or ITI or Equivalent or National Apprenticeship Certificate (NAC) grant by NCVT for recruitment in other than Civil Engineering, Mechanical, Electrical and S&T. 1 The examination fee for all candidates Rs. 500/- with a provision for refunding Rs. 400/- to those who actually appear in the trails. 2 For candidates belonging to SC/ST/Ex-Servicemen, Minorities and Economically Backward Classws. RS. 250/- with a provision for refunding the same to those who actually appear in the trails.